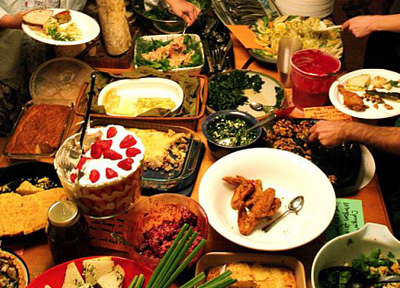 To answer “what is potluck”, it is the time when a particular institution or organization holds an event where members of the institution and organization can bring in food from their homes into a food party. It is a very nice way to create bond between people as everyone will be bringing homemade food unlike other parties where foods are usually made by caterers. If you are the supervisor in any organization or institution and would like to invite your colleagues and staff members to pot luck, then Yoovite.com has an amazing online invitation tool by which you can accomplish the same. The main activities in potlucks are sharing and eating. There are no games or singing or dancing. You gather in a room or hall dedicated to holding the function and share what you have brought and also eat what your colleagues have brought. There is no set pattern as to who should share what at what time. Just bring in the foods and arrange them and let people take their pick. There is no particular theme that you need to follow. However, you can think of decorating with pictures of various recipes. Having light background music and an ambient lighting would really set the scene. Potluck is about sharing food and hence you need to arrange for sufficient tables and plates. If everyone brings recipes for potluck, then you don’t want to run out of space. Further, the disposal of plates and food waste should be handled properly. If possible, hire someone to do that. You can buy disposable plates or ask the cafeteria in your company or institute to provide you with the plates for a few hours. In your potluck invitation, encourage everyone to bring their favorite food. If all the colleagues can come to a consensus as to what they are going to bring, you can ensure variety. Further, if the staff population has people from different parts of India, you can expect a varied cuisine. Make sure that people bring in sufficient quantities of the food they plan so that everyone gets to taste it. Make sure that you have people to arrange the food categorically so that people can pick easily while they start eating. It is easy to make people bring in their favorite food potluck recipes if you can arrange for some gifts or prizes for the best potluck cuisine. You can also arrange for goodies given to every participant so that everyone gets encouraged into bringing something. Potluck lunch or dinner is an event to bring people together and is not an eating competition. Hence foodies should control themselves so that everyone gets to taste the food brought by their colleagues.